~ by psi07 on 15 April 2007. Love it. 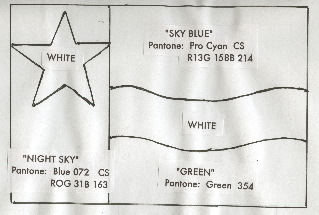 Personally, I’d make the star a little smaller so as not to touch the edges of the blue field. But that’s about it. DO make every attempt to replace the existing flag. And good luck! Oh – and the construction sheet should specify the proportions as well as the colors (what a nice combination!) How wavy do you want the stripe?